FarmHearts is a collaboration of community organizations whose missions align with the conservation of agriculture as an important community value and economic asset. 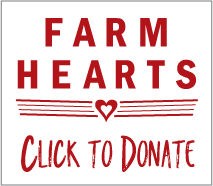 FarmHearts has established a grant program for emergency relief, stop gap measures, or other agricultural projects to help keep small farms viable and operating. Grants from $500 to $2,500 are available (with greater amounts possible in limited circumstances and as funds allow). The program is supported through grant writing, fundraising and private contributions, and administered through Catskill Mountainkeeper and Cornell Cooperative Extension Sullivan County. FarmHearts also offers information and referral for technical assistance, grants and other resources that support small farms. An advisory committee made up of representatives from the agricultural sector, along with community groups that include Bethel Woods, Catskill Mountainkeeper, Cornell Cooperative Extension Sullivan County and Sullivan Renaissance guides the work and grant making of FarmHearts.